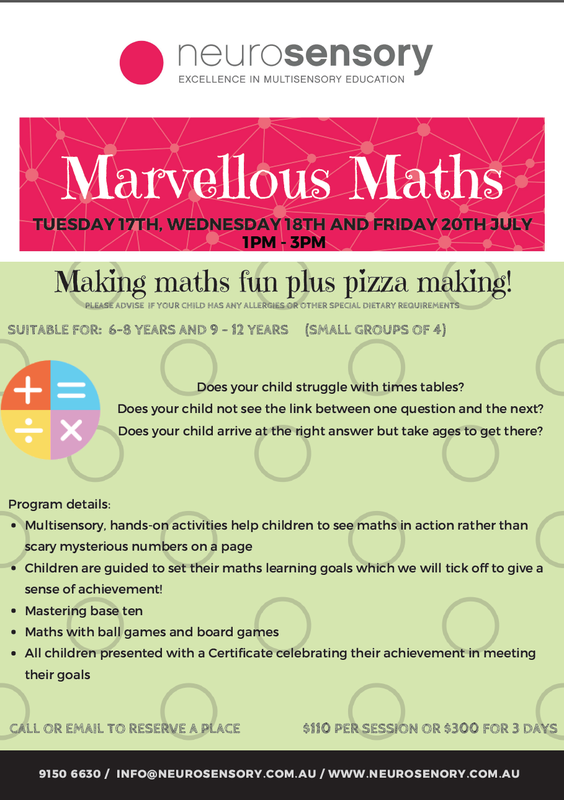 Antonia has recently given two conference presentations on dyscalculia and the use of multisensory teaching approaches as a way of bringing the abstract world of maths into an easier to understand format. The presentation at the MANSW conference was more detailed than the earlier one including demonstration of teaching resources such as the Math-U-See program we employ at Neurosensory. There was great feed-back from the MANSW presentation with many teachers spending a long time talking about various points and resources well after the official 90 minutes alloted by the organisers. Games and activities to reinforce Multisensory learning plus cupcake making! Antonia Canaris director of Neurosensory has just returned from the US where she attended the 2013 64th Annual International Dyslexia Conference on Reading, Literacy & Learning. Held in New Orleans the birthplace of jazz and a city still recovering from the ravages of Cyclone Katrina, Antonia joined over 2000 delegates from around the world in an intensive series of workshops, presentations and seminars that focussed on evidence based interventions and strategies to help those with dyslexia and other learning difficulties. Asked for her comments on her return, Antonia emphasised the commonality of treatment that surrounded the remediation of dyslexia saying ‘I returned wiser and more dedicated than ever to helping those with learning disorders such as dyslexia and I am confident Australians can learn a lot from the evidence based approaches that are being adopted to learning disorders around the developed world. I would like to emphasise the need for evidence-based teaching for those with learning disabilities and disorders. Approaches such as the Orton Gillingham multisensory approach as used by Neurologics is an evidence-based approach based on a body of knowledge dating back to the 1920s that has been shown to work most effectively in remediating learning disorders. It was comforting to be part of a conference that emphasised evidence-based teaching’. On 14 November Antonia Canaris and Peter Hill directors of Neurosensory attended a seminar held by the Centre for Independent Studies called ‘Why Jayden can’t read’. The title is a reference to a book published in the United States that highlighted the problems with the whole word approach to literacy. This is not a sterile debate when you consider the huge percentage of 15-year-olds (close to 40% according to the ABS ) in Australia who leave school unable to read or write effectively or sufficient to gain employment. How this has come to pass was the subject of the seminar. Jennifer Buckingham a leading literacy researcher at Macquarie University, Tom Alegournarias, President of NSW Board of Studies and Justine Ferrari, national educational correspondent with the Australian presented papers on the current state of literacy in Australia. Jennifer Buckingham and Justine Ferrari highlighted the appalling state of literacy in Australia and there was considerable discussion as to its cause. Tom Alegournarias provided a response as president of the New South Wales Board of Studies and members of the audience engaged in debate about the history of the crisis, why it has been allowed to develop, and it seems educational experts powerless to intervene. The tragedy is that many years later , after the initial debate that prompted the writing of why ‘Jayden can’t read’ we are still engaging in an ideological debate between those who support the whole word style of learning and those who consider a phoneme-based approach the preferred evidence-based option. There was certainly no answers but certainly a lot of goodwill to provide a united front to tackle what is really a scourge on our society. Antonia, director of Neurosensory presented a case study at the Learning Differences Convention at Darling Harbour in early November 2013 on the devastating psychological, educational and emotional consequences of untreated dyslexia on a young man’s education and self-esteem. Using ‘’Chris’’ as an example Antonia outlined the path this young man took as he worked his way up the educational ladder from initially receiving sometimes less 4% in his school assignments to obtaining credits or better at TAFE. Antonia summed it up saying, ‘Chris had been through the mill, misdiagnosed, over diagnosed, and ignored. Once a formal diagnosis was made Chris was suffering severe dyslexia an individualised treatment program could be devised and Chris blossomed. Chris will never be cured of dyslexia because there is no cure, but with the right strategies he will survive and hopefully flourish. Indeed, he is already designing and building exceptional cabinet work at TAFE. Chris’ story should warm all our hearts and give hope to many’. Antonia Canaris was asked to present a paper entitled, ‘Adults reconnecting with study and employment’ at the Adult ADHD Annual Conference ‘Succeeding with Adult ADHD’ on 12 October 2013. Antonia emphasised that multiple psychological challenges were as equally important as organisational stumbling blocks for adults with ADHD entering or competing in the workforce. By way of encouragement, Antonia referred to a self-published book, ‘My Secret’ written by ‘Mary-Anne’ an adult with dyslexia Mary-Anne came to Antonia when she was in her late 40’s and travelled over 300 km there and back in one day from Maitland to Kingsgrove to receive Orton-Gillingham multi-sensory approach remedial teaching. As Antonia emphasised, ‘’The human spirit is remarkably resilient and Mary-Anne overcame huge psychological and educational obstacles as well as dealing with the tyranny of distance, to achieve her goal of overcoming all at least coming to terms with dyslexia. Mary-Anne currently works in real estate.